Per the thoughtful blurb on the back cover, 1993 gave rise to some 4000 independent singles in the US alone (had no idea anyone was keeping score)! Good on Shredder Records/Shredding Paper mensch Mel Cheplowitz for sorting out so many of the vital ones, particularity in such a robust era when it seemed like every week there were at least half-a-dozen must-haves hitting the shelves. Remember when? Anyway, Mel and I (not to mention probably a lot of you who frequent these pages) were on the same wavelength, evidenced by this who's-who of twenty subrosa luminaries. 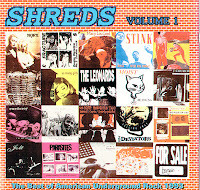 The emphasis on Shreds Vol 1 is clearly skewed to indie and punk-pop outfits, or moreover ones that straddled the fence narrowly dividing those two contingents. Not a lot of big indie farm-team type labels are represented (save for perhaps Fat Records' NOFX who contribute the seminal lesbian narrative "Liza and Louise"), rather there's a strong emphasis on records that bubbled up from micro-indies and private labels. A healthy portion of this coveted roster have materialized in one or more features on Wilfully Obscure - Corduroy, Parasites, Fig Dish, J Church, Bracket, Tugboat Annie, Jolt, and The Deviators, yet in many cases the music was sourced from my own vinyl rips, whereas the versions here strike me as being culled from the master tapes. Shreds functions as both a time capsule and a goldmine of tuneful, indie-punk treasures worth their weight in Nuggets from a parallel universe. We're even thrown a couple curveballs via the bendy dream-pop of the Swirlies, and even the relatively demure Mary Lou Lord made the cut. My favorite Prisonshake song, "2 Sisters" is included as are offerings from the Karl Hendricks Trio, The Leonards, and Mr. T Experience. Time won't allow me to extoll much further on the music contained within, so just go ahead and download this already! Let me know what you enjoyed. 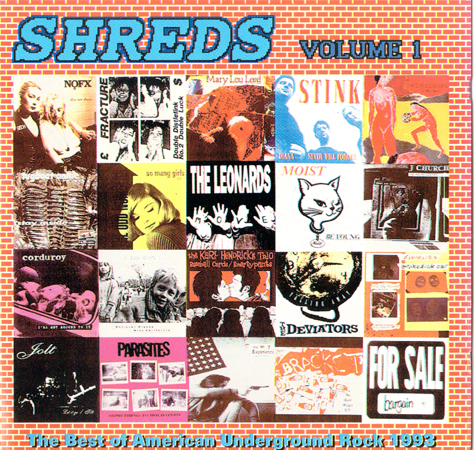 Shredder was a very good punk pop label, competing very well with Lookout. Definitely worth checking out. love. this. comp. still listen to it 20+ years later. Thanks for this! I'd like to put in a request for the Dambuilders "tough guy problem" ep. Out of all the Shreds comps, this was the most consistent. Maybe I'll get to some of the others later. We'll see about that Dambuilders ep. Yes, yes ~ the most consistent! 'cos it has JChurch!! Spavid, spavid ~ when you will reupload bad links of 2007? Is your profile email still valid? I just learned about the dead 2007 links. Maybe I'll get a few back online this week...or later. If you have any specific requests let me know. Some might even be back in print. here is a little information on almost all absent files. next time (approx. end of 2012) I will send you more. and note that some of them may be reuploaded already. Wow! Thanks for putting this together for me. I appreciate the effort and it will definitely make things easier. Awesome! These files once were on the net. See someone somewhere might be very jealous to crawl the web and remove again and again so that the poor people can not get what belongs to them. The dogs of war! Let's fight. we useta have this in th juke at a bar where i ran sound in th mid/late '90s and we'd close EVERY nite with "2 sisters"
no words to describe how cool this comp is.